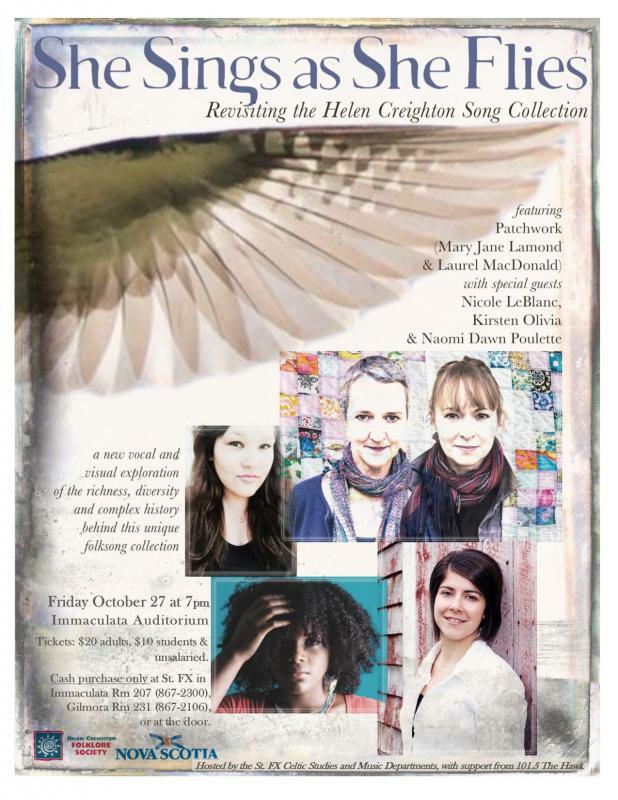 She Sings As She Flies - Revisiting the Helen Creighton Song Collection - a new vocal and visual exploration of the richness, diversity and complex history behind this unique folksong collection will be held on October 27th at 7:00 p.m in the Immaculata Auditorium on the StFX campus. Featuring Patchwork (Mary Jane Lamond & Laurel MacDonald) with special guests. Acadian, African Nova Scotian, and Mi’kmaq communities respectively. cultural environment then, and now. Scotian singers, illustrating the richness, diversity and complex history behind this unique folksong collection. Presented by the StFX Celtic Studies and Music Departments.